Faced with a blade aggression, should you run? But often, you cannot. You might be injured, restrained, in a tight space, or be witha family member, or be debilitated by your own panic. In this film, evaluate your potential and develop supremacy of speed, precision, awareness, and emotional control. Gain a calm psyche and agile body, combine relaxation with strong movement, establish the correct distance physically and psychologically, and defend from cuts, stabs, slashes of one or both knife-gripping hands, standing and from the ground. Unique drills such as activation stabs, ripping your hand from a grip without cutting yourself, moving and surviving when unable to use your arms, and making your blade a powerful continuation of your arm. Tremendous insights,drills, and demonstrations. Join Vladimir’s master class and be ready for complete and integrated control of a knife. I really enjoyed the film, it provides a practical and natural way of moving instinctively. The knife is an insanely dangerous weapon. Facing the knife (or knives), is life and death. Vladimir Vasiliev teaches and demonstrates that when defending against a knife attack, size, strength and technical patterns count little toward your survival. What will bring you through is your free body – created by these foundational Systema methods, and your unbound mind – imbued with Vladimir’s unparalleled defensive creativity and your survival depends on sensitivity, versatility and the unlimited creativity of your reactions and pre-emptions. These abilities in turn depend on mastery of your breath and inner tension. Those are precisely the attributes developed by the overall Systema training program and nowhere are they more fully exemplified and exploited than in dealing with the blade. The presentation touches all bases: one knife, two knives, standing work, supine, prone, partially immobilized, controlling, distracting, striking, disarming, disabling, multiple attackers, and more. There’s also the amazing ingenuity of how both sides of every drill (the attacker’s work and the defender’s responses) cultivate the same fundamental integrated qualities and skills in all participants for future application to any role in any scenario. And one theme binds them all, rules them all – the unique kinetic genius which Vladimir places directly into our hands with this instructional masterwork. This is the best instructional knife DVD I’ve seen!!! Incredible mastery of knife work and knife defense! This video is not a quick 2min tutorial on “how to defend against a knife”; nor is it a compilation of various “techniques”. It is rather a profound review of plethora of aspects that play into something as complicated as defense against knives. It includes a review and learning modules about your psychological state, body movement, correct breathing and so much more! One can’t expect to learn the subject in 2 mins, so it is only appropriate that Vladimir spends so much time with his students to take them through the journey from fundamentals to Mastery! Great video and thank you! We just finished watching Vladimir’s newest video, Knife Master Class; what an amazing video! This is one of the most needed videos especally in today’s world. Vladimir shows and explains how under stress or panic and without the proper training, we will most likely escape into tension and freeze, which can have devastating consequences! This video has new and fresh drills that anyone can put into practice, not just a martial artist. Also there are amazing drills on using a knife as a tool of protection. We highly recommend this video! It’s a video on how to survive! 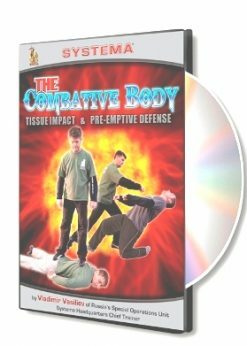 Although this video is primarily conceived as a tool for surviving a knife attack, it also provides a series of self-awareness and advanced sensitivity exercises which allow movement and escape without reacting which is the prerequisite for natural survival. A lot of time is devoted to the importance of movement to escape with the body and avoid locks, as well as on dealing with the psyche when confronted by a knife to the point of becoming comfortable when working with a knife. 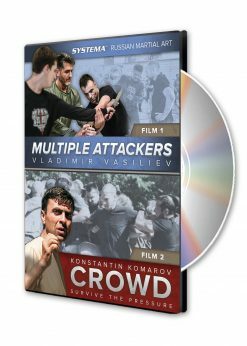 Vladimir Vasiliev shows the reality aspect of a knife attack which reflects different scenarios that can be applied in any setting – from a street attack to military combat. The drills and situations shown in the video enable the Systema student to learn how to use the whole body as a weapon while covering all he terrains and dimensions of a fight: using arms, legs, kicks, grabs and punches in knife defense. However, it is important to stress that Vladimir Vasiliev does not teach you only how to control the knife, he teaches you how to control the whole person. I have seen all of Vladimir’s videos and in my opinion, “Knife Master Class” video is one of the most advanced and complete. In my vast experience of training with the military, special forces and with different martial artists from around the world, I can affirm that the one thing that is essential in a knife fight and which is shown in detail in this video, is continuous and dynamic movement which enables one to be ahead of the fight at all times, and to take charge of any situation instead of just reacting to a situation. I sincerely recommend this video to Systema practitioners of any level for improvement of skills and for a better self understanding. Aunque este video está concebido en primer lugar como una herramienta para sobrevivir un ataque con cuchillo, tambien ofrece una serie de ejercicios avanzados para adquirir autoconciencia y sesibilidad que facilitan el movimiento y el escape sin reacción, lo cual es imprescindible para sobrevivir. En el video se destaca la importancia del movimiento para escapar con todo el cuerpo y así evitar bloqueos. También se insiste en enfrentarse con los problemas mentales en el momento de estar amenazado con cuchillo, hasta el punto de sentirse cómodo manejando el cuchillo. Vladimir Vasiliev presenta el aspecto real de un ataque de cuchillo, lo que incluye diferentes escenarios que se pueden aplicar en cualquier situación – desde una pelea en la calle hasta el combate militar. Los ejercicios y las situaciones presentadas en el video capacitan el estudiante de Systema a aprender cómo utilizar todo el cuerpo como un arma mientras cubren todas las dimensiones del combate – el uso de los brazos, puños, golpes y patadas en la defensa contra el cuchillo. Cabe destacar que Vladimir Vasiliev no sólo enseña cómo controlar el cuchillo, sino cómo controlar el individuo completo. He visto todos los videos de Vladimir Vasiliev y en mi opinión el video “Knife Master Class” es uno de los más completos y avanzados. En mi larga experiencia de entrenamientos en el ejército, las fuerzas especiales y con practicantes de diferentes clases de artes marciales de todo el mundo, puedo afirmar que lo esencial en el combate con cuchillo es el movimiento continuo que le permite a uno tener la ventaja en todo momento, y de dominar la situación en vez de sólo reaccionar a la situación. Todo esto y más está detalladamente presentado en este video. Recomiendo este video con toda sinceridad a practicantes del Systema ruso de todos los niveles. 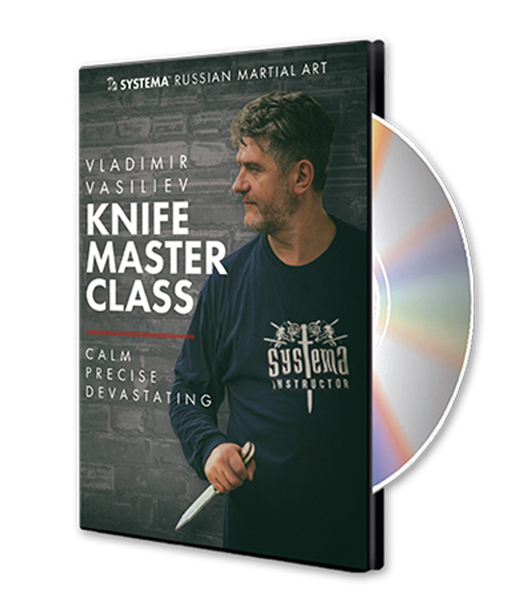 Vladimir Vasiliev’s latest DVD, Knife Master Class, expands on the instructive and informative library of System videos with an in depth discussion of the attributes necessary for mastery of the knife in a fight, new and insightful drills and exercises and amazing demonstrations of Vladimir’s application of the work. The instruction begins with a specialized “activation drill” to prepare the psyche for work with the knife. This drill immediately demonstrates the fear and tension that comes when faced with a knife. Vladimir then shows how to use breathing and proper movement to dissipate this tension, calm the psyche and prepare the body to be both soft and responsive, while at the same time creating the power necessary to work effectively against an armed opponent. 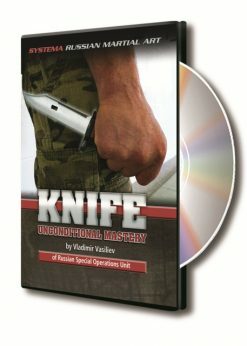 There are over a dozen new and unique drills and exercises demonstrated in this DVD which will help students to master several subtle aspects of working with a knife, including how to truly make the knife an extension of your arm, working with the flat of the blade and developing control of the wrist for fine work. Yet, as impressive as the techniques are, the exercises and demonstrations go much deeper than technique. Vladimir’s instruction will help you to identify the fear and tension that lead to incorrect movements and locking oneself, both of which are deadly mistakes when dealing with a knife. His drills show you how to correct this by learning to work on yourself to overcome these obstacles. Vladimir teaches students to work against the knife, to not only be reactive, but to be very much in control of the entire situation, not just of the knife. Vladimir’s demonstrations are amazing to watch and demonstrate fully the capabilities of a well prepared and stable psyche and properly conditioned body. This video adds tremendously to the already considerable vault of information on knife work demonstrated in Vladimir’s previous films on the subject. 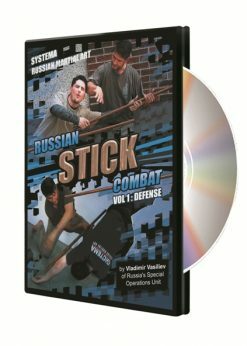 The content is deep and well explained, and chalk full of gems of insight from Vladimir on all areas of Systema. I thought this DVD was excellent! Not only does it have lots of great exercises to learn from, but most importantly, it shows very common mistakes people can make without even knowing. A knife is probably the most dangerous & versatile weapon one can be faced with… We all have many involuntary responses to attacks which can make an encounter with a knife far worse then it needs to be. I truly recommend this DVD to give everyone a greater understand of those dangers and to help you work past them. Dealing with a knife isn’t always as perfect as we would like it to be, there is rarely a person lunging directly or showing us their movement, and in reality it can be very difficult to predict how an attack will come. Sometimes attacks can come from different directions, while on the ground, and without even being able to see them. 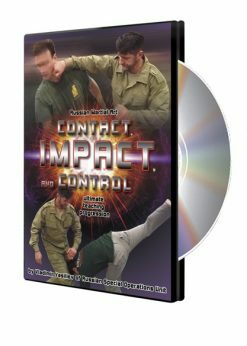 This DVD teaches how to move properly against a knife from any direction or position whether it is seen or not, all while remaining calm. It is complete in its teaching of knife work from all the physical movements to the psychological states that gets adapted by both attacker and defender and how to deal with them. I have seen the disk and compliment you on this great release. It was very nice to see (quality of production) and easy to follow (quality of instruction), plus numerous familiar voices and faces present have gifted me a beautiful evening in a nice company. Thanks a lot from all my heart!